I am the one in charge of putting together videos for Church’s use, and often I’ve to go around filming pastors’ saying a prayer of blessings to put at the end of each video. One of my pastors has a special fondness for Aaron’s blessing, and he usually prays it bilingually with such gentleness that just hearing it alone makes you feel much blessed already. As with all video editing tasks, I had to replay and listen to each clip several times over the course of my editing – to blend, to add in subtitles, to adjust the audio and so on. It didn’t take long for me to memorize this 3-verses long prayer of blessing. In today’s study, we will examine the very first verse of this 3-verses long Aaron’s prayer of blessing. It’s a really general verse compared to many many other prayers in the Bible, a general prayer of protection and favour – which is all the more applicable to us in our own lives and situations. Just to get a clearer idea on where the prayer originated from, especially since it came in the middle of all the laws and statistics – The book of Numbers is the 4th book of the Bible, and also the 4th of a collection of books known to be written by Moses, also called the Torah by the Jewish people. Numbers is a continuation of the history of the Israelites in their exodus from Egypt, where the book of Leviticus left off, and will be continued by the book of Deuteronomy. In it, God not only reiterates his promises as can be often received from these 5 books, he also established clarity in laws and structure. In Numbers 6, God commands Moses on the vow of the Nazirite – in vowing to be separated from the world. This idea of separation from the world is notably also seen in other parts of the Bible, for example in Romans 12:2 – Do not conform any longer to the pattern of this world, but be transformed by the renewing of your mind.Then you will be able to test and approve what God’s will is—his good, pleasing and perfect will. By separating themselves from the world, it also means that they affirm themselves to belong to God. The Lord – LORD here is in small caps, which means that the original term is YHWH, or Yahweh or Jehovah, depending on which rendition you prefer – the name of God, as compared to Lord in lower case, which would mean adonai – my Lord, my master. Everytime the name of God is called upon, it must be a matter of consequence. This prayer of blessing was told by God himself to Moses, who was charged to tell Aarons and his sons to pray this for the Israelites. You know how some people will say, just go to the shop and say my name, and you’ll get a discount? A vastly different proportion; but somewhat the same meaning – our names have power. Imagine God’s name? 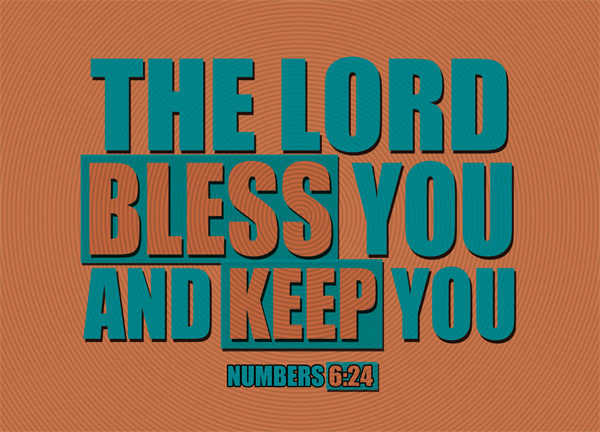 bless you – There are two main kinds of blessings – God blessing us, and us blessing others. In Gen 12:2 God said of Moses – I will make you into a great nation and I will bless you; I will make your name great, and you will be a blessing. In this verse there are both kinds of blessings: God blessing on Moses, and Moses blessing others. In the priestly prayer, it is clearly stated that the Lord – Yahweh, will bless you. When God blesses us, all we need to do is to receive his blessings. keep you – Or protect you. By taking the vow to become a Nazirite, they are vowing to be not of the world but of God – and as they belong to God, God will protect them from harm, fromt the evil One, from sin, from falling away from Him – basically, keeping them from leaving the path of grace and salvation. Every Christian is basically a Nazirite, we may not have taken the vow or went through the rituals, but we are separated from the world and not of it but of God. God is the focus of our lives, and we seek to honour him. God has again and again, throughout the whole Bible and not just in the Old Testament, promised to protect his people. Whenever you are able to, why not pray this for yourself and for others? A simple, general prayer of blessing and protection – which is really at times, a greater prayer than any other. You mention that your pastor does this bilingually… Hebrew perchance? If so, please post a vid. I, too, love this benediction and chant in Hebrew as well as English, but would love to hear someone else’s rendition. Interesting thought on YHWH speaking ‘of Moses’ in Gen 12:2. Certainly, I see that verse as speaking of Messiah, who Moses was a foreshadowing (‘one like unto me will come…’), and I see all people’s being blessed through the recording of the Law, but I don’t see Moses as the one made into a great nation… Maybe it was a typo and you meant ‘to Abraham’ with Moses as a type of partial fulfillment? Good spot;) I’m embarrassed; I certainly meant Abraham – in that whole paragraph.